Avoid These Common Midwinter Furnace Repair Needs! The fortunate thing about today’s gas furnaces is that they are built to last, and run into very few malfunctions during their lifetime. Well, at least, this is true if you have your gas furnace professionally installed and regularly maintained on a routine basis. This will help ensure you can relax during the winter, knowing there’s little chance you’ll have furnace trouble. If you skipped maintenance, on the other hand, or even if you have an aging furnace, there’s a bigger chance you’ll run into a midwinter furnace repair need. You can call on us if this occurs. 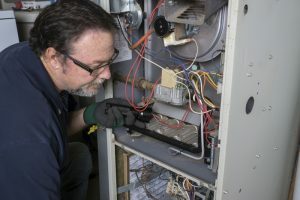 In the meantime, we want to go over a few common midwinter furnace repair needs so you can be more prepared if you, in fact, face one. This is a component in your furnace that measures the temperature in the combustion chamber and shuts off the burner and blower fan when it becomes too hot. This is part of the regular heating cycle as well as a safety mechanism. If the limit switch fails, it can mean a furnace that won’t turn on at all, or one that keeps running without turning off. Your gas furnace does use a some electricity in order to operate. Most of this electrical power goes to the blower motor, which circulates air through your furnace and then your living space. If this motor’s bearings wear down, it loses lubrication, or it becomes infiltrated with too much dust or debris, it can burn out. Sometimes, you can catch this before it occurs by listening for a screeching sound from the furnace or acrid smells from the vents and calling in a pro for repairs. If the motor does burn out, you’ll need an HVAC pro to adequately replace it. Short-cycling is the name given to the process where your furnace cycles on and off rapidly, rather than in regular cycles, therefore never completing a full heating cycle. This is the symptom of many possible issues. And it means that not only does your furnace not have sufficient time to distribute heat, but your furnace is stressed. If your furnace components have too much strain put on them, it wastes money and creates other repair needs. Keep in mind that short-cycling may be due to a clogged air filter. Changing your air filter is something you can, and should, do on your own every 1–3 months. Another possibility is that you’re dealing with a miscalibrated thermostat, and don’t actually have a problem with the furnace at all. We can’t stress enough how dangerous a problem this is for your furnace. Cracks in the heat exchanger enable toxic exhaust gases to enter your living space, presenting a clear safety hazard. This is a problem that usually only affects aging heaters—those over a decade old. You install carbon monoxide detectors in your home so you will be alerted to its presence right away. If you have an aging furnace and/or you skipped maintenance this year, you have one of our experts look at the system ASAP to ensure it’s operating efficiently. For quality Santa Fe, NM heating services, contact Roadrunner Air Conditioning, Heating & Refrigeration today!